• ...a self-serve smorgasbord of delicious and healthy frozen yogurts, 462 combinations of ever-changing, always-tempting flavors, and a hot/cold toppings megabar that ranges from all-natural to borderline decadent. I-Go YoGo…think of it as your own personal Health Club! “I-Go YoGo Loyalty Club” is our exclusive customer Loyalty Club and REWARDS program, that you pay $.35 per ounce instead of $.42 and is designed to keep you in the know about all things YoGo. Once you are a member of I-Go YoGo Loyalty Club whenever it is your birthday or anniversary if you are married, you will get a Free Reward Cup of 7oz. or a credit towards a normal purchase. A Free Yogurt Every Week For Life? It’s true. When you join the I-Go YoGo Club, you can get a free yogurt every week for as long as you like. That’s because whenever you visit YoGo Express five times, you get a free 5 ounce yogurt on your sixth visit. Stop by each day, Monday through Friday and during the weekend, get a free 5 ounce serving of yogurt and toppings. • ...community at its very best; a neighborhood gathering place, where a portion of every dollar goes back into our community to support local programs and services. Photo Phriday - We just ordered a photobooth that can hold up to 10 people for the additonal space. Photo Phriday nights coming soon. FYI YoGo Express now has seating for 120 and WiFi with plenty of plugs! 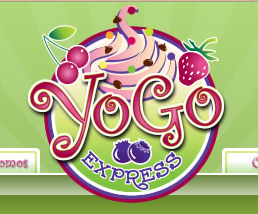 YoGo Express - Come on in!